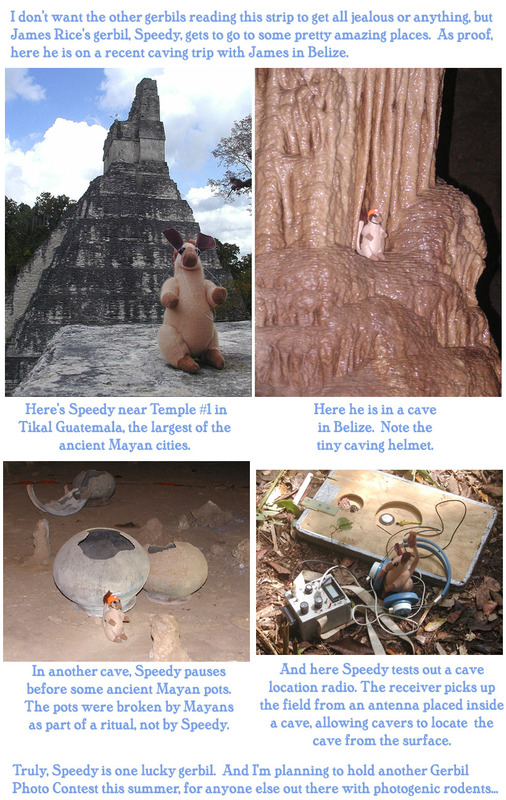 Moments after I had taken the photo of Speedy in Tikal, I heard a camera shutter behind me. The unknown photographer shooting me, shooting Speedy commented that he had once met a man traveling the world with a rubber chicken. Note to readers: If, like me, you have tendencies toward claustrophobia, DO NOT LOOK UP THE AMAZING STORY OF FLOYD COLLINS. It will give you nightmares. Take particular care not to read the vivid account in Ken Smith’s excellent book Raw Deal: Horrible and Ironic Stories of Forgotten Americans. Consider your health. FUN FACT: When Floyd Collins finally died, everybody just left him at the bottom of the cave until, years later, his family raised enough money to dig him up and give him a proper burial. ADDITIONAL FUN FACT: Later still, the family sold Floyd’s body to the then-owner of Crystal Cave so he could dig it up, re-enbalm it, and display it in the cave as an attraction. FINAL FUN FACT: Needless to say, Floyd’s corpse was eventually stolen by pranksters. His left leg was never recovered. Now that’s a raw deal. Next week, more photos of Smokey in the Philippines. I promise. And now they’ll share their adventures right here! He’s off once again, what a thriller! Now, where will he go? Next time Shaenon needs Sunday filler! Yo, Floyd Collins, I’m real happy for you and I’mma let you finish, but Stephen Bishop was the best cave explorer of all time!